In an unnamed Third World country, in the not-so-distant future, three dumpsite boys make a living picking through the mountains of garbage on the outskirts of a large city. One unlucky-lucky day, Raphael finds something very special and very mysterious. So mysterious that he decides to keep it, even when the city police offer a handsome reward for its return. That decision brings with it terrifying consequences, and soon the dumpsite boys must use all of their cunning and courage to stay ahead of their pursuers. It's up to Raphael, Gardo, and Rat--boys who have no education, no parents, no homes, and no money--to solve the mystery and right a terrible wrong. Andy Mulligan has written a powerful story about unthinkable poverty--and the kind of hope and determination that can transcend it. 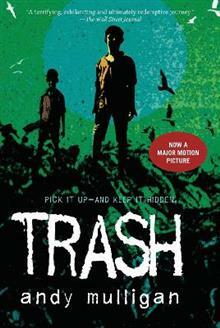 With twists and turns, unrelenting action, and deep, raw emotion, Trash is a heart-pounding, breath-holding novel. From the Hardcover edition.